Every racing organization has its own set of rules about passing. Let’s take a look at some of them in order from brief to verbose. Next week we’ll talk about how the rules are actually used and some best practices as a result. Lucky Dog prides itself on its brief rulebook and the passing rules are no exception. 12. h. Passing. The passing vehicle is 100% responsible for the careful and safe preparation, planning and execution of the pass…period. If you are about to be passed, it’s most helpful to give the passing car hand signals as to which side you will allow them to pass on. But most importantly, you need to hold your line and remember that the other car is responsible for safely getting around you. Lemons is tongue-in-cheek as usual. They don’t specifically define passing rules. The arbitrary nature of the rules and penalties turns off some drivers. 6.0: Penalties: Black-flag penalties are assessed for dangerous behaviors and/or being a douche. 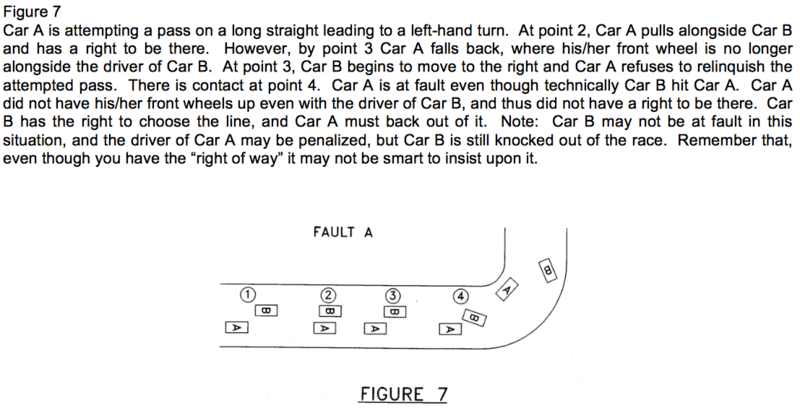 These behaviors include, but are not limited to, contact for any reason; wheel(s) leaving the pavement; speeding in the pits; missing/ignoring a safety flag; racing to the yellow or red flag; overly aggressive driving; hitting a wall, cone, tree, safety vehicle, the track restaurant, etc; lack of car control; thinking the line has a deed and you own it; unsportsmanlike conduct; annoying the hell out of us; annoying the hell out of everyone else; etc. Despite being a rather large and complex entity, the SCCA rules are quite brief. A. Drivers are responsible to avoid physical contact between cars on the race track. B. 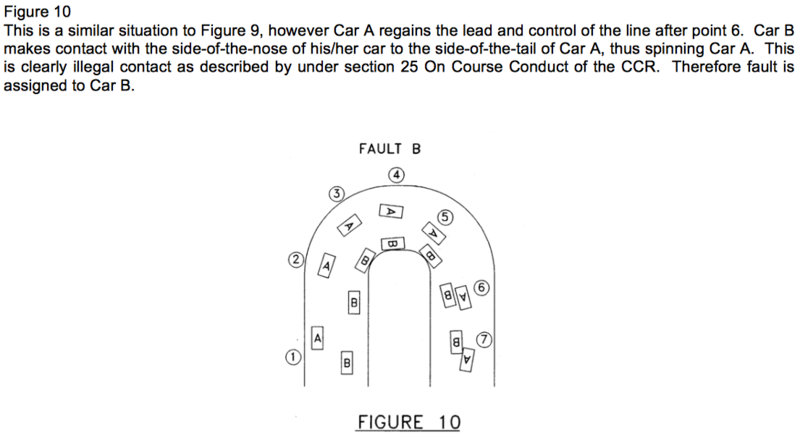 Each competitor has a right to racing room, which is generally defined as sufficient space on the marked racing surface that under racing conditions, a driver can maintain control of his car in close quarters. C. Drivers must respect the right of other competitors to racing room. 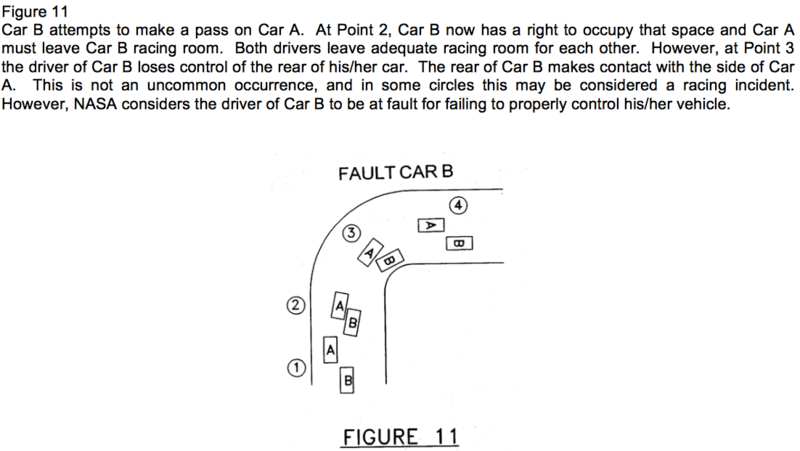 Abrupt changes in direction that impede or affect the path of another car attempting to overtake or pass may be interpreted as an effort to deprive a fellow competitor of the right to racing room. D. The overtaking driver is responsible for the decision to pass another car and to accomplish it safely. The overtaken driver is responsible to be aware that he is being passed and not to impede or block the overtaking car. 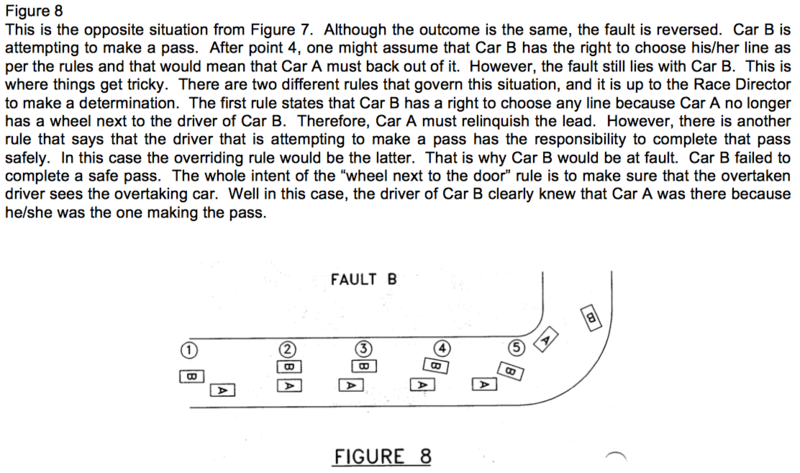 A driver who does not use his rear view mirror or who appears to be blocking another car attempting to pass may be black flagged and/or penalized, as specified in Section 7. The ChampCar rules are very similar in wording and spirit to the SCCA rules. 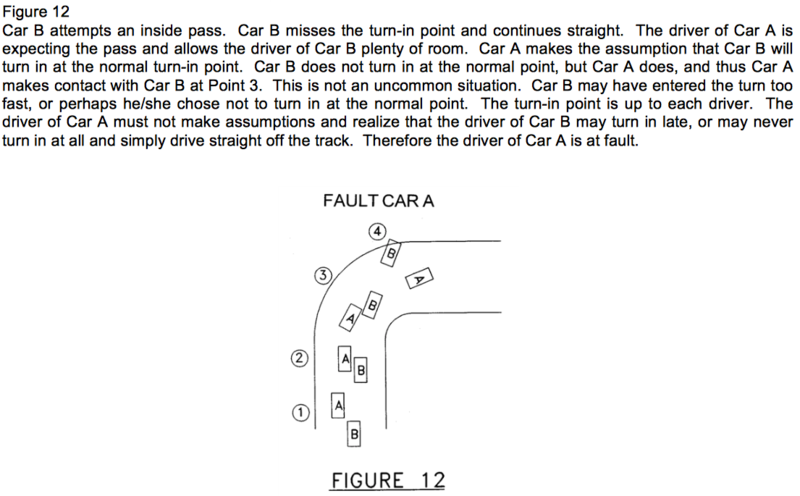 But they add a few specifics about driving on the racing line and blocking. They also further define what a complete pass is. 7.2.1. 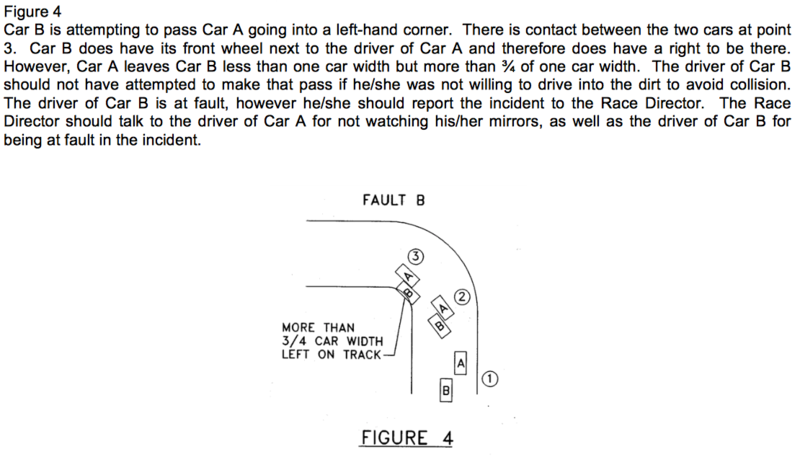 It is the responsibility of all drivers to avoid physical contact between cars on the race track. All competitors have a right to “racing room” on the marked racing surface. “Racing room” shall be generally defined as sufficient space on the marked racing surface to allow a competitor to maintain control of his/her car. 7.2.2. The responsibility for passing another car and accomplishing that pass safely rests with the overtaking driver. The driver that is about to be overtaken has the responsibility to be aware that he or she is about to be passed, give hand-signals and shall not impede the overtaking car. 7.2.2.1. The driver being overtaken should, at all times, remain on their racing line unless the car is impaired and is unable to maintain an adequate racing speed. 7.2.2.2. The driver being overtaken shall not block. Any driver who fails to make use of their rear view mirror, or who appears to be blocking another car seeking a pass, will be black flagged and/or penalized. 7.2.2.3. It is the responsibility of the overtaking car to prepare for, plan and execute a FULL and COMPLETE safe pass. The definition of a full and complete pass is when the overtaking car has extended a lead of approximately one car length ahead of the vehicle being passed. WRL is similar to those above, but adds specific language about the order of precedence when defining fault. They also further define racing room. a. Contact: World Racing League is a non-contact racing club. To avoid contact, all drivers should maintain racing room at all times and in all situations. “Racing room” is defined as allowing all competitors room to maneuver their car on the racing surface, or more simply put, giving your competitor a lane to race in. Position: For the purpose of determining position, a car attempting a pass is considered to have established position once it’s front axle has pulled even with the rear axle of the car being passed. AER rules are pretty similar to those above, but add that the slower car should indicate which side they want to be passed on that cars in different classes should not interfere with each other. 9.1. Every competitor has the right to racing room, which is defined as sufficient space on the paved racing surface that under race conditions a driver can maintain control of his car in close quarters. 9.2. The car entirely in front has the right to choose any position on track, so long as it is not considered to be blocking. 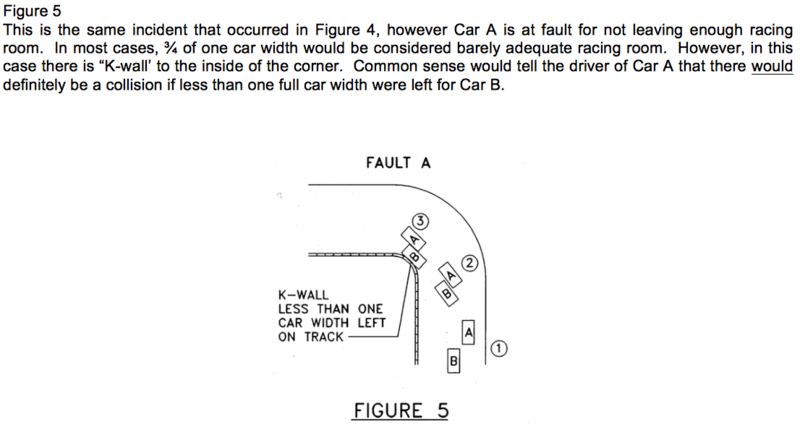 Blocking is defined when a driver makes two or more line changes in an attempt to prevent the trailing car from passing. 9.3. A driver who does not use his mirrors or appears to be blocking another car attempting to pass may be black flagged, and may be penalized. 9.4. Ultimately, the decision to make a pass and do so safely solely rests with the overtaking car. The car being overtaken should be situationally aware of the fact that they are being overtaken, and not make any sudden or unpredictable moves or blocks to impede the ability of the overtaking driver to pass. 9.5. 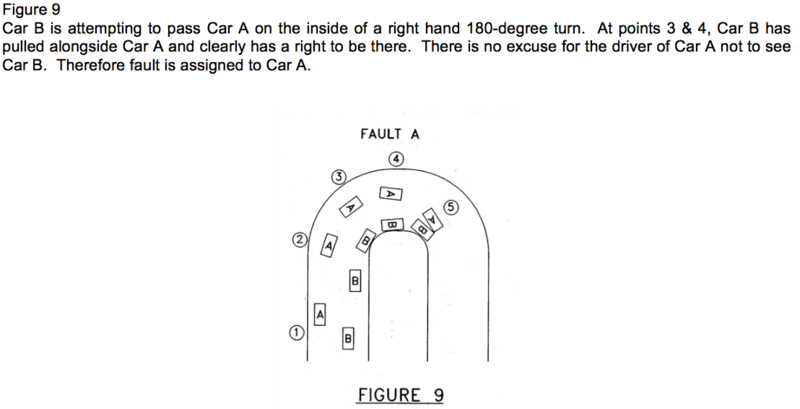 When possible and when it becomes apparent that a pass is going to occur, it is a courtesy and strongly suggested that the car being passed to indicate to the passing car on which side they would like to be passed on. 9.6. 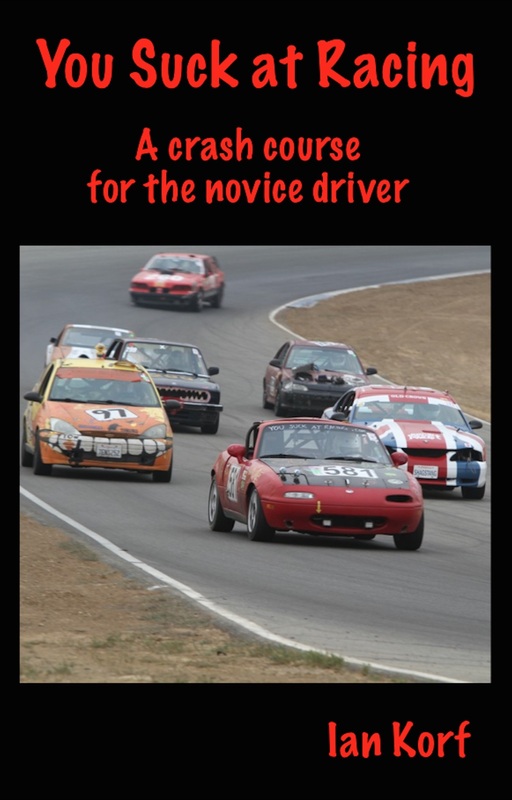 Cars who are not racing in the same class are strongly encouraged to work with each other to effectuate a prompt and safe pass. Drivers should be aware that they may come upon a situation where two other cars are in a heated battle in their respective class and should try to accommodate any passing required without holding up that battle. It should be noted that this applies to classes faster and slower than you. NASA has the most detailed rules on passing as they have several examples and rulings in the appendix. It’s very useful to read this section even if you have no interest in racing with NASA. A driver may choose to protect his or her line so long as it is not considered blocking. 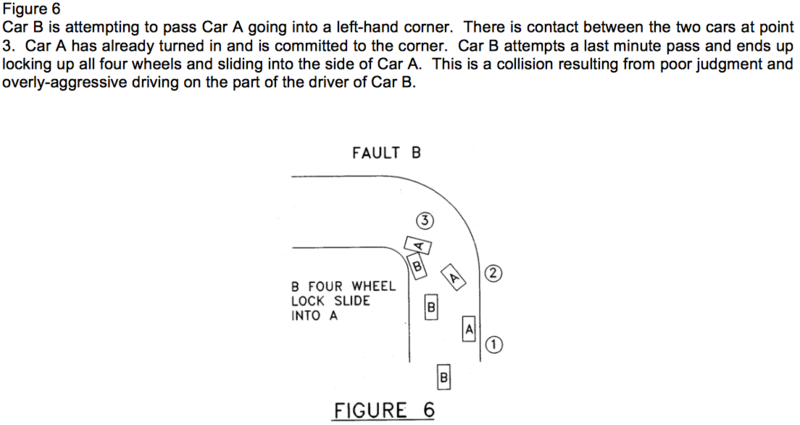 Blocking is defined as two (2) consecutive line changes to “protect his/her line,” and in doing so, impedes the vehicle that is trying to pass with each of the two (2) consecutive movements. Drivers are encouraged to check with the Race Director for a full explanation before the start of the race.